I love that my birthday is in December because I feel like I get an abundance of gifts that month, however, sometimes the rest of the year can seem rather boring in the sense that I don’t get showered with coupons from stores and shops for free or discounted items. That’s why I love RA Sushi’s Hook Up Club. 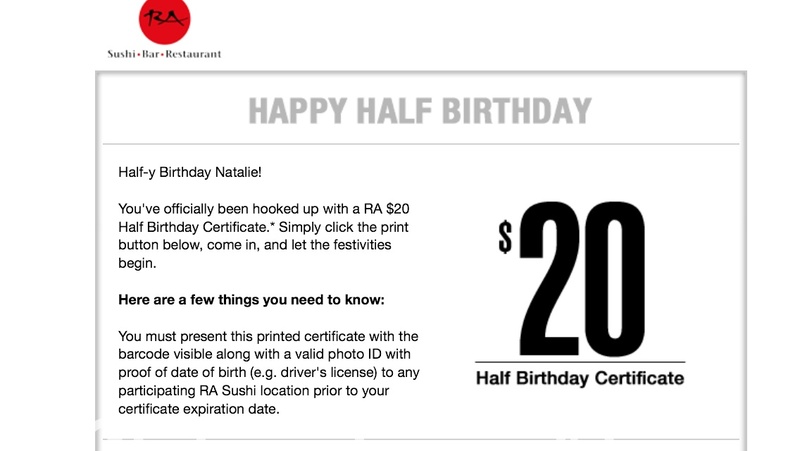 It’s totally free to sign up, and they give you a $20 gift certificate on your half birthday! Since I am celebrating my half birthday this month, my bestie and I decided to enjoy a night of fresh sushi. Here is my Half-y Birthday certificate! I love the eclectic, yet modern flare that RA Sushi has to offer. It reminds me of a great place where adults can hang out, celebrate a birthday, and catch up, yet still feel like they are in a vibrant ‘club like’ place. If your little one doesn’t mind the loud atmosphere and enjoys sushi, then by all means, take them with you. 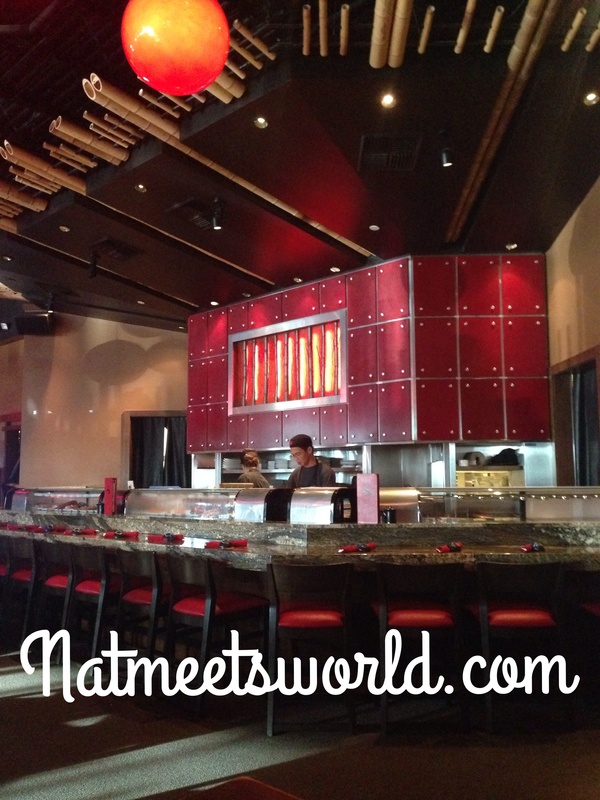 If you love Benihana, you will love RA Sushi. 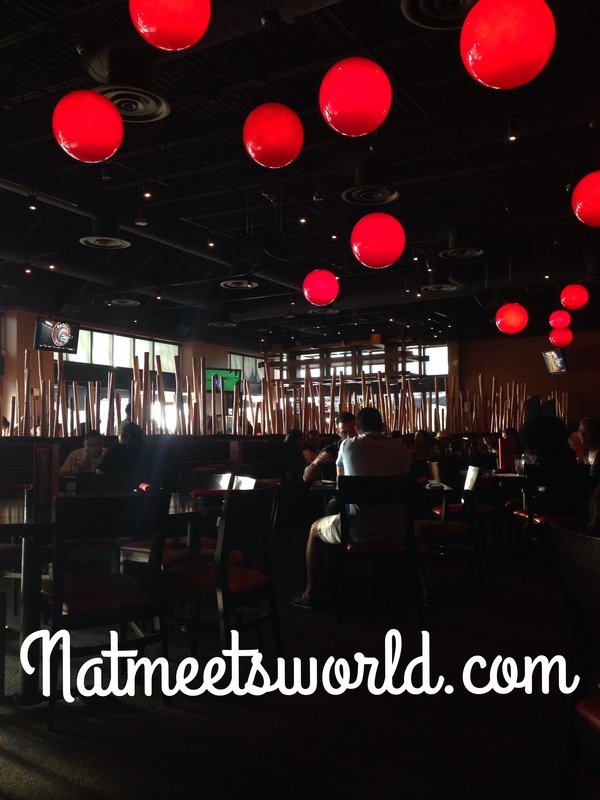 They are partners in offering outstanding Japanese food! As I stated earlier, RA Sushi has loud music and dim lighting. 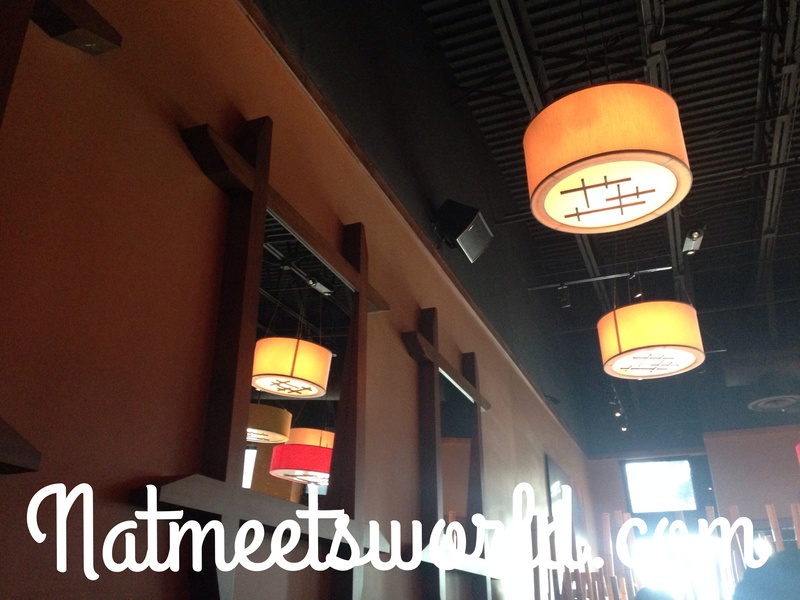 They offer indoor and outdoor seating with plenty of comfortable seating arrangements. There is also a bar where you can see live sushi chefs making a plethora of sushi rolls. 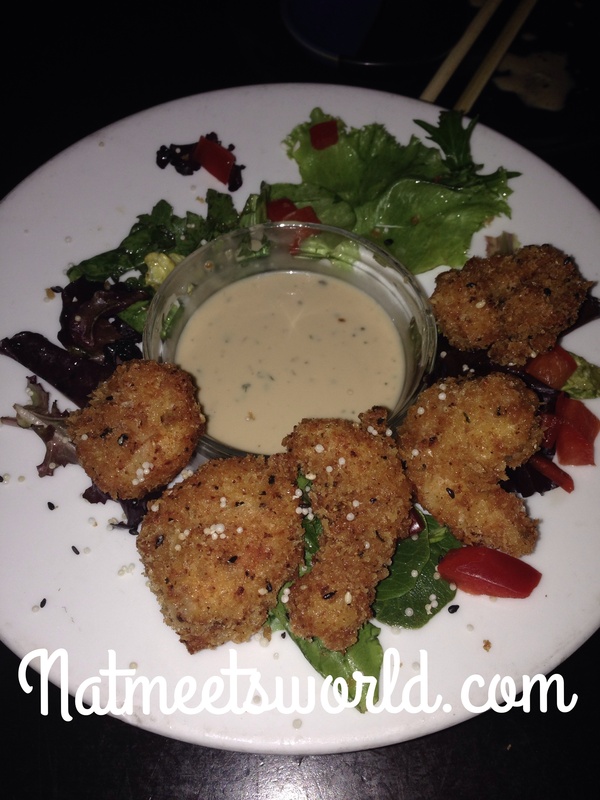 The “Ra”ckin’ Shrimp appetizer is highly recommended at RA, and it is undeniable that its pop of flavor is the reason as to why it is so popular. This crispy shrimp is served over mixed greens and includes a creamy ginger teriyaki sauce for dipping. My best friend ate half of it before I could snap a pic, so here is what was left lol! My bestie opted for the Ultimate Shrimp Tempura Roll which included spicy kani kama crab mix, cucumber, and shrimp tempura, rolled and topped with seared tuna and avocado. I chose the crunchy shrimp tempura roll as my entree. 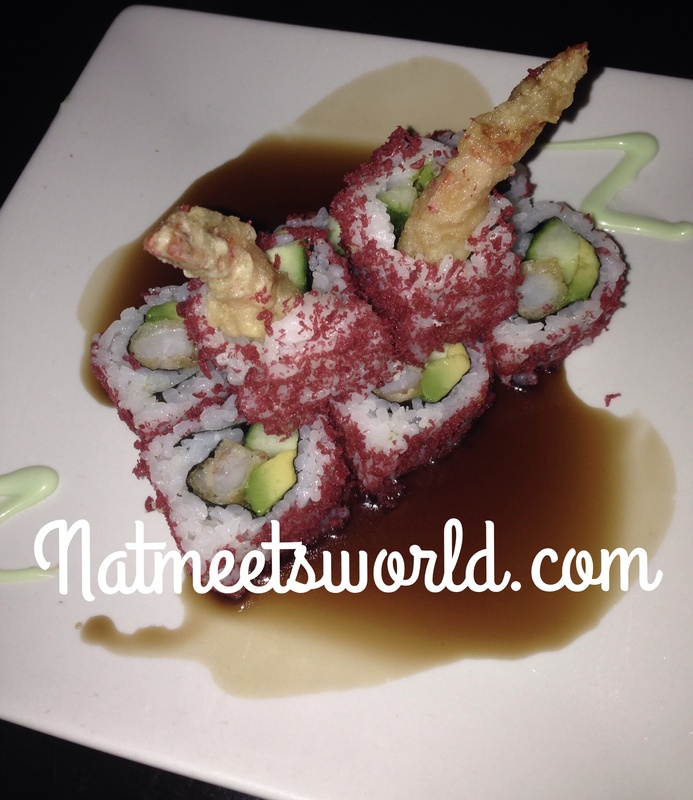 This roll includes shrimp tempura, spicy kani kama crab mix (which I switched out for avocado), and cucumber rolled and topped with red beet tempura bits and drizzled with sweet eel sauce. Although it is not pictured, I really love and highly recommend the shrimp tempura appetizer and edamame at RA. All of the food we ate was absolutely delicious! The sushi was fresh and made to order (which I love). I would highly recommend RA Sushi for all sushi lovers. If you plan to go soon, click here so that you can sign up to their e-mail list (the Hook Up) for your half birthday certificate. You can also check out locations and other fun stuff here. 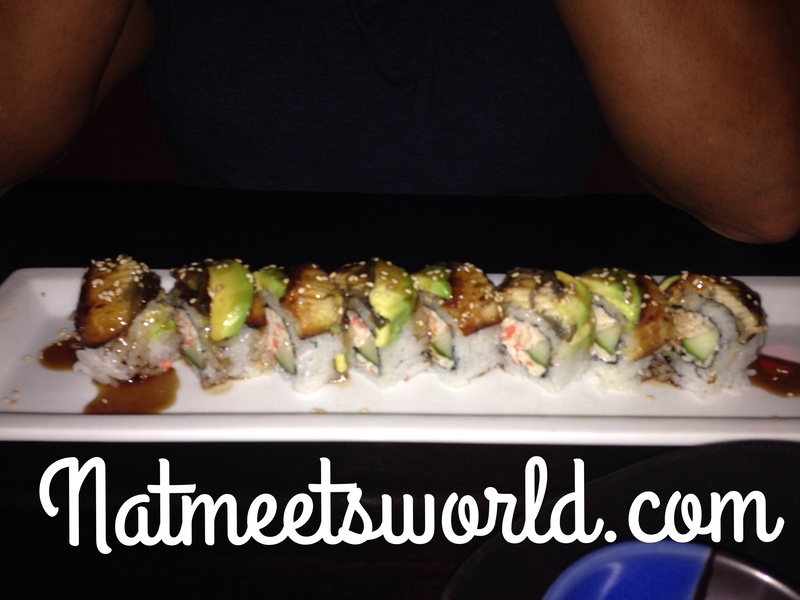 HAve you been to RA Sushi? What did you think? Comment below!